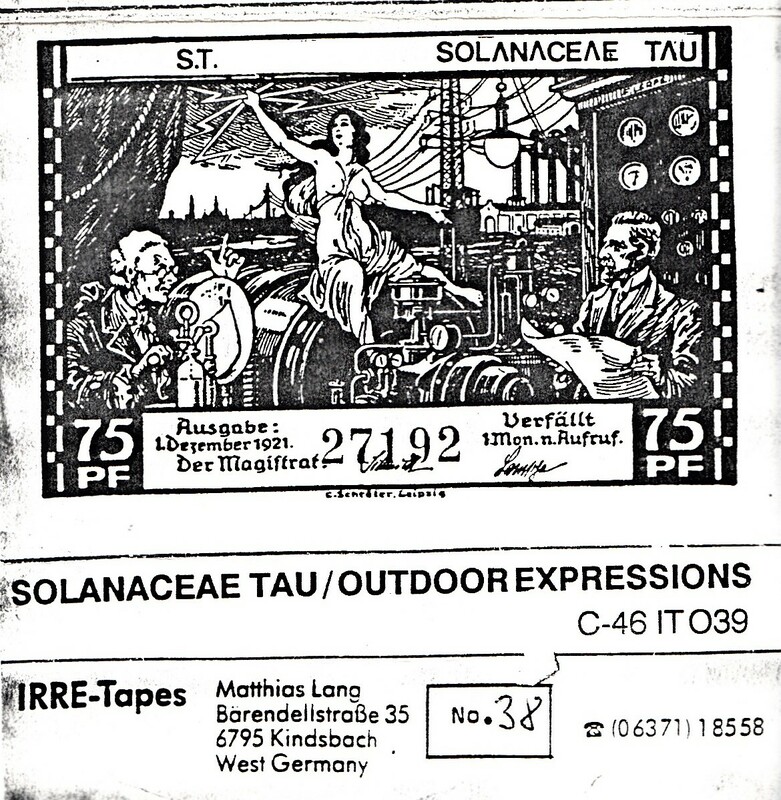 Solanaceae Tau was founded in the early 80ties and made a lot of releases in the tape industrial and gothic scene in Germany, Holland, France, Italy, UK and after the departure of their female vocalist they etablished (after a break) in a new personal structure with the same project`s name in 1998. The musical base is inspirated to the dark wave music from the eighties:psychedelic and EBM with some of the neo folk / gothic music of today mixed with collages and tapeworks. The project members are Jason Fretz (guitar) Nicci Harrington (vocals ) and Axaxaxs ( synkussion, keyboards, tapes ).They compose and produce their music in their own small studio with reel tape machines, computers and virtual and real instruments. (info taken from Soundclick). I already posted A Chemical In Debris and Transgerman Mind Configuration,both amazing tapes by this great anti-fascist electro project. 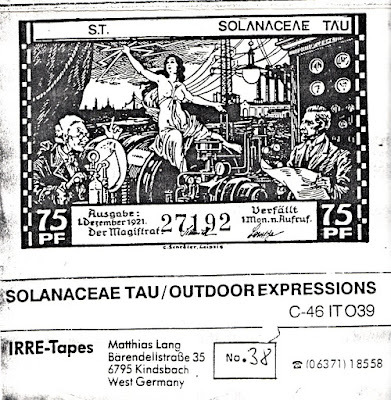 I also already wrote about Irre Tapes German label run by Matthias Lang which evolved out of the IRRE Fanzine he published regularly during the early 1980's covering New Wave, Post Punk and the German Underground. In true DIY spirit he supported the international network of small labels and fanzines through editing the free IRRE Newsletter to spread infos and contacts and writing occasionally reviews for various publications.All of the releases where copied on demand and continously numbered but only a few had an explicit Limited Edition(info from discogs).